This article is about a stage from Super Smash Bros. Melee. For other uses, see Peach's Castle (disambiguation). 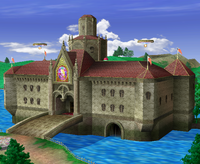 Princess Peach's Castle is a stage that appears in Super Smash Bros. Melee, and its appearance is heavily based upon Princess Peach's actual castle. Unlike the Peach's Castle stage from Super Smash Bros., in this stage, players fight on the roof of the castle. This time, three colored switches (red, blue, and green) appear every once in a while, and they create temporary platforms and ! Blocks that release items (except heavy items) if attacked or touched and act as platforms themselves. Banzai Bills bombard the rooftop at random intervals, and they will cause massive damage and knockback to anyone caught in the blast. Princess Peach's Castle is also featured in Adventure Mode, where the player, after passing through the Mushroom Kingdom, battles both Mario and Princess Peach on the stage. If the end time of the previous Mushroom Kingdom stage ends with a two in the individual seconds, Luigi will appear instead of Mario and a small cutscene plays involving Luigi's knocking Mario away and defeating him. In the castle, a small drain entrance at the bottom right-hand corner can be seen, which is likely to be a reference to the door at the castle moat from the original Super Mario 64. The unlock match for Dr. Mario takes place here. The stage returns in Super Smash Bros. Ultimate, with updated lighting and background. The Banzai Bills keep their rotor-like back ends, but other than that resemble their modern design. This page was last edited on March 12, 2019, at 15:05.